Summary: Researchers discover two new areas of the brain involved in facial processing. There’s nothing quite like the rush of recognition that comes from seeing a familiar face. But scientists have been hard-pressed to explain how we identify well-known faces–or how that process differs from the way we perceive unfamiliar ones. Now researchers at The Rockefeller University have begun to unravel the mystery of how the brain recognizes familiar faces. Working with rhesus macaque monkeys–primates whose face-processing systems closely resemble our own–Winrich Freiwald, head of the Laboratory of Neural Systems, and Sofia Landi, a graduate student in the lab, discovered two previously unknown areas of the brain involved in face recognition: areas capable of integrating visual perception with different kinds of memory. Their findings were reported today in Science. Scientists have long known that the brain contains a network of areas that respond selectively to faces as opposed to other kinds of objects (feet, cars, smartphones). They also knew that humans process familiar and unfamiliar faces very differently. For example, we excel at recognizing pictures of familiar faces even when they are disguised by poor lighting or shot at odd angles. But we struggle to recognize even slightly altered images of the same face when it is unfamiliar to us: two pictures of a stranger we’ve never seen before, for instance, shown from different perspectives or in dim light. Yet attempts at divining the neural basis for these differences between familiar and unfamiliar face perception in humans have proven inconclusive. So Freiwald and Landi turned instead to macaques, close evolutionary cousins whose face processing networks are better understood and more easily studied than our own. The researchers expected the macaque face processing network to respond in much the same way to the first two types of faces. But instead, the entire system showed more activity in response to the faces of long-time acquaintances. Faces that were only visually familiar, meanwhile, actually caused a reduction of activity in some areas. “The whole network somehow distinguishes personally familiar faces from visually familiar faces,” says Landi. 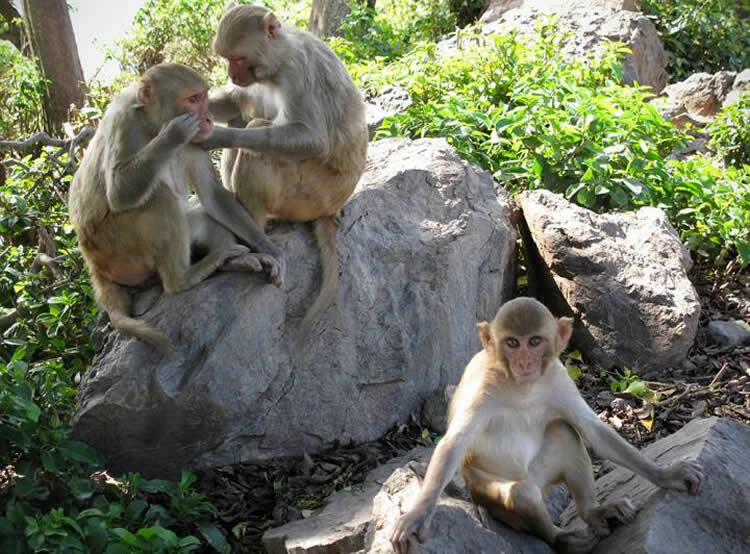 Even more surprisingly, the faces of animals whom the macaques had known for years prompted the activation of two previously unknown face-selective areas. These two newly discovered brain areas offered up yet another surprise. When the researchers showed the macaques blurry images of personally familiar faces, which gradually became sharply defined over the course of half a minute or so, the activity of previously known face-processing areas increased steadily over time (imagine a diagonal line climbing upwards on a graph). But the new areas first showed little or no initial increase in activity, followed by a sudden surge (imagine a flat line followed by a steep upwards curve)–an all-or-nothing response that evokes what Landi calls “the sudden ‘aha’ moment” we experience when we recognize a familiar face. These new findings will allow the researchers to further investigate the neural mechanisms that underlie face recognition–and how the brain responds to different kinds of familiarity. “We’ll now be able to study these things with much more precision than was possible before,” Freiwald says. And because they reside in regions of the brain that are associated with different kinds of information, these novel areas should also provide an inroad to understanding cognitive and perceptual processes that go well beyond vision. “It opens a window to explore the interaction between face perception, memory, and social knowledge,” says Landi, who is already working on new experiments designed to do precisely that. Funding: Funding provided by Howard Hughes Medical Institute, Center for Brains, Minds, and Machines funded by National Science Foundation, NIH/National Eye Institute, NIH/National Institute of Mental Health. Image Source: NeuroscienceNews.com image is credited to Laboratory of Neural Systems at The Rockefeller University. Rockefeller University “How the Brain Recognizes Familiar Faces.” NeuroscienceNews. NeuroscienceNews, 10 August 2017. <http://neurosciencenews.com/How the Brain Recognizes Familiar Faces/>. Familiarity alters face recognition: Familiar faces are recognized more accurately than unfamiliar ones and under difficult viewing conditions when unfamiliar face recognition fails. The neural basis for this fundamental difference remains unknown. Using whole-brain functional magnetic resonance imaging, we found that personally familiar faces engage the macaque face-processing network more than unfamiliar faces. Familiar faces also recruited two hitherto unknown face areas at anatomically conserved locations within the perirhinal cortex and the temporal pole. These two areas, but not the core face-processing network, responded to familiar faces emerging from a blur with a characteristic nonlinear surge, akin to the abruptness of familiar face recognition. In contrast, responses to unfamiliar faces and objects remained linear. Thus, two temporal lobe areas extend the core face-processing network into a familiar face-recognition system.